Non-conductive material eliminates the need for expensive insulated bridge hangers. Highly resistant to corrosive road chemicals, salt, bacteria, weather conditions and ultraviolet decomposition. Expansion and contraction forces are minimal. Due to the non-metallic material properties of fiberglass, damaging electrolysis will not occur. Available with a complete line of factory bends/elbows, expansion joints and bridge hangers to accommodate virtually any installation requirement. ** Actual Wall Thickness is required to meet the performance requirements of this specification. Other wall thicknesses are available upon request. 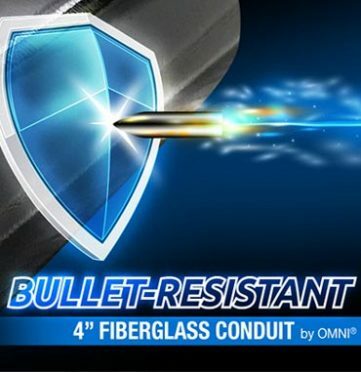 Black is the standard color of the OMNI® fiberglass conduit. Other colors can be specially ordered and this is useful to color- code a conduit such as orange for telephone or fiber optic cables. OMNI can also provide smaller diameter conduit in sizes from ¾” to 1 – ½” in various walls.